It was a wild week for the US equity market, with the sp' swinging from a high of 1912 to 1820, bouncing to 1898, and settling at 1886. Net weekly changes ranged from -1.0% (sp'500), to +3.2% (Trans). Regardless of any bounce into the sp'1900s, the primary target are the sp'1650s. The break below sp'1900 was very significant, taking out a wheel barrow of aspects of resistance, not least the 200 dma. The fall to 1820 was pretty severe, but then so was the bounce into Friday afternoon of 1898. Underlying MACD (blue bar histogram) ticked lower for a fourth consecutive week, and is at levels not seen since summer 2012. Near term outlook is uncertain. There remains the threat of a sub 5'th wave lower, to 1815/00 zone. In any case though, a move to 1920/50 seems likely, before a stronger down wave that should take the market to the low 1700s... possibly straight to the key fib retrace level in the 1650s. The weekly 10MA in the 1960s is going to be extremely difficult to break and hold over.. no matter how confident the mainstream might be in early November. For traders, 1970 makes for a very valid 'last line in the sand' for short positions. The tech' fell just -0.4%, but it made for the fourth consecutive weekly decline. In terms of near term downside, the big 4k level makes for a rather obvious target. The monthly cycles offer 3500/300. The mighty Dow fell around -1.0%, having hit a new multi-week low of 15855, the lowest level since early February. With the break of trend on the weekly AND monthly cycles, the Dow looks to have put in a key intermediate high in the 17300s. 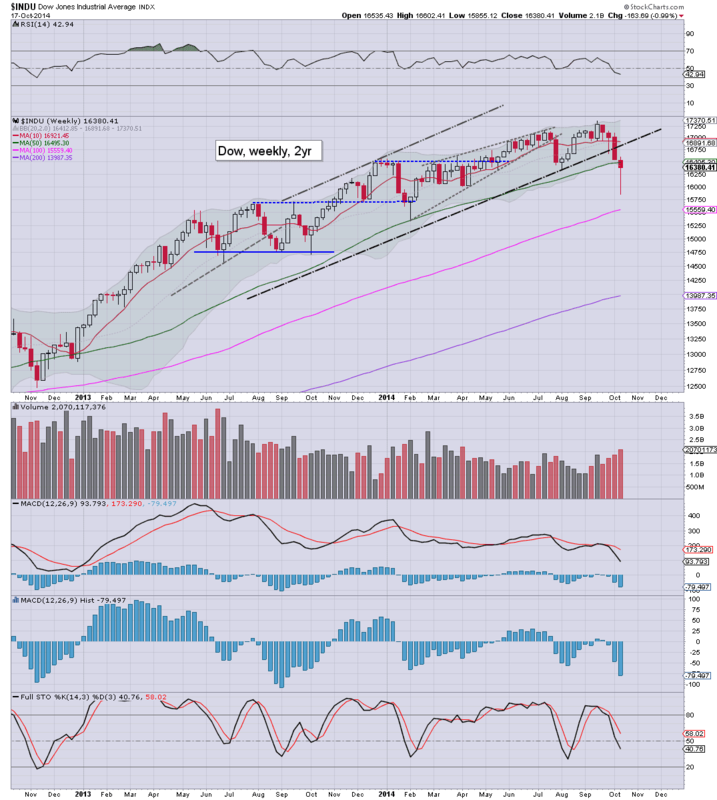 Primary downside - as suggested by the bigger monthly cycle, is around 14700. On any basis though, no matter how upset the market might get across the next few months, a break <14k looks extremely unlikely. 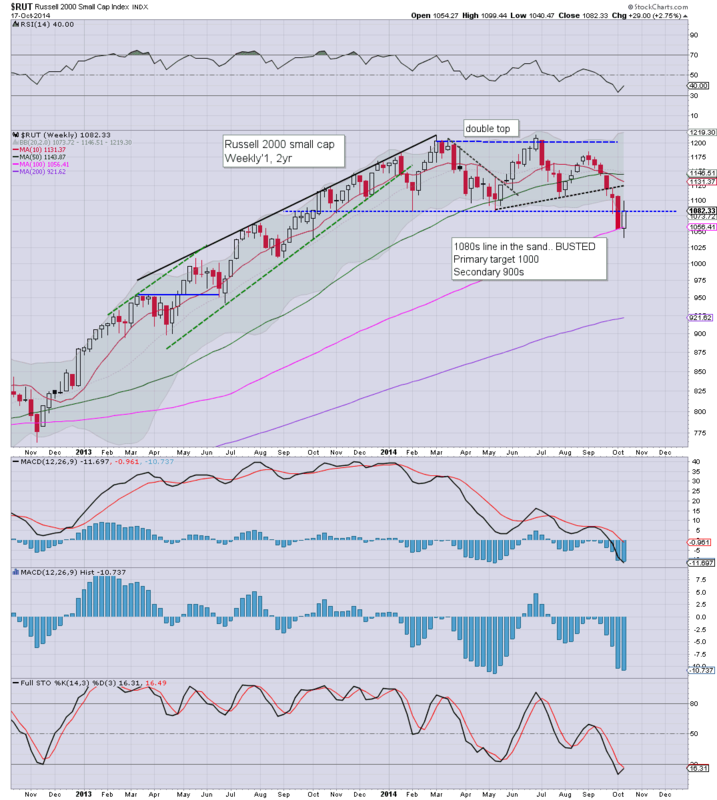 The master index slipped just -0.4%, but it made for the fourth consecutive weekly decline. Regardless of any bounce in the near term, there looks to be very viable downside to 9300, which is around 10% lower, and would equate to sp' in the low 1700s. The second market leader showed some significant strength this week, with a net weekly gain of 2.7%. 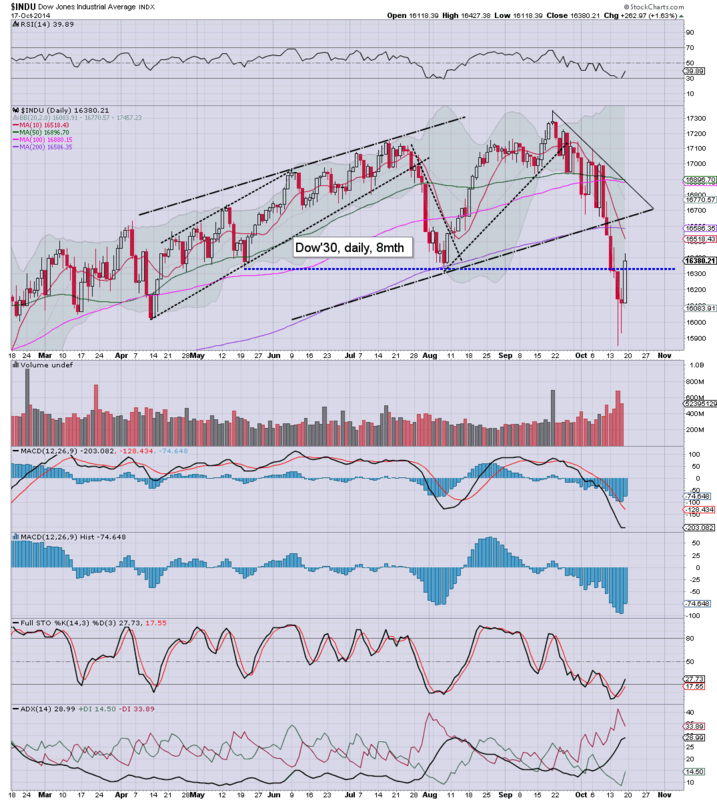 The weekly close of 1082 was around the old busted support floor of 1080. 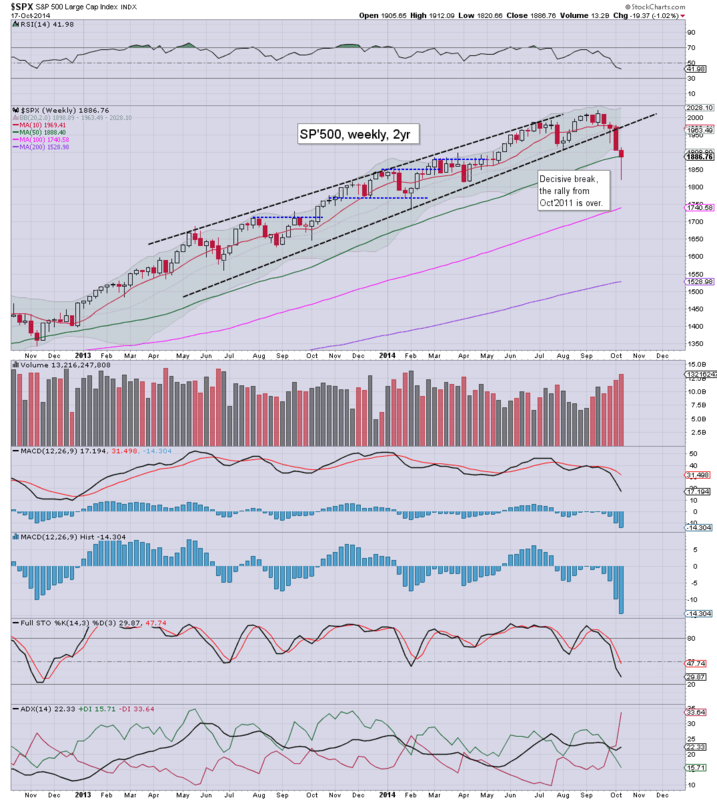 The weekly low of 1040 is highly indicative that the big 1000 threshold will be tested in November. 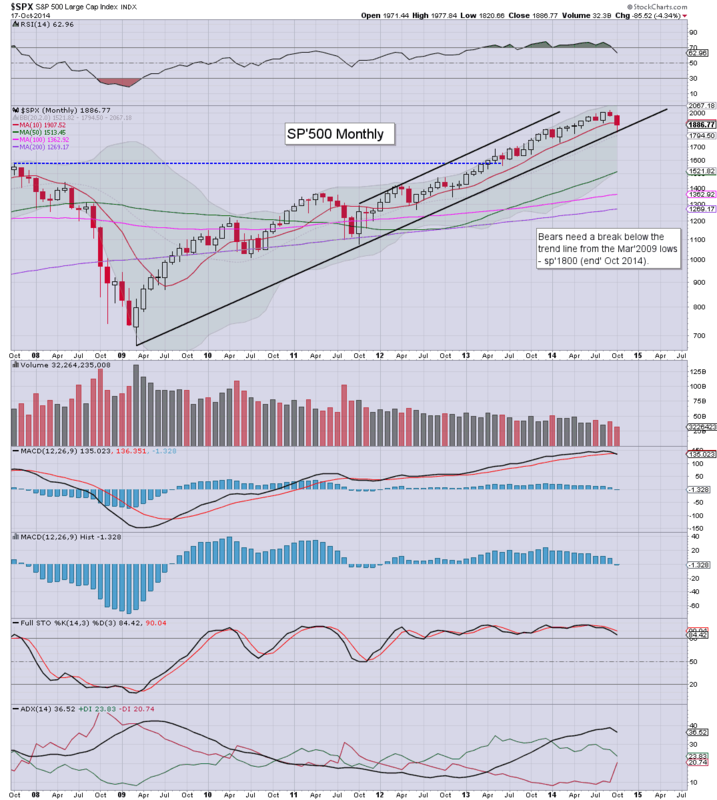 The bigger monthly cycles are offering the low 900s. The 'old leader' closed with a significant net weekly gain of 3.2%, the best gain since last April. There will be strong resistance around the 10MA in the 8300/8400s. 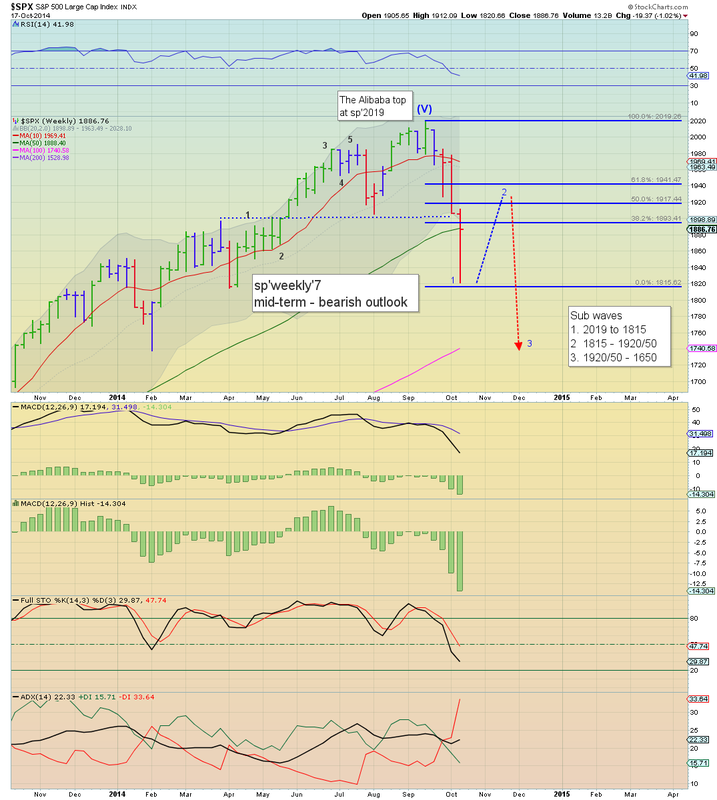 A weekly close back in the 8500s looks extremely unlikely for some months. So... a week of two halves. Exceptional weakness to sp'1820, but then a rather powerful ramp into the Friday close. 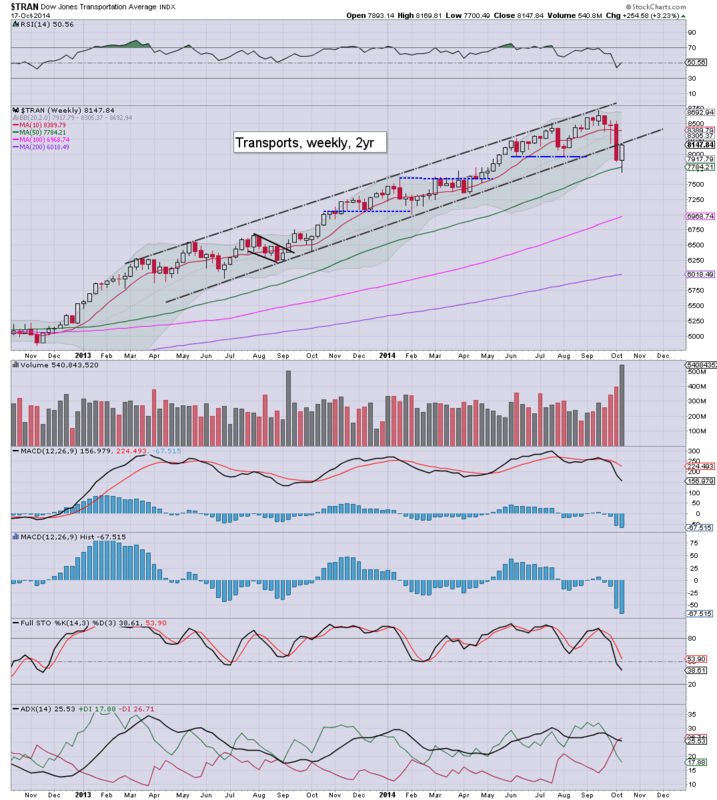 The two leaders - Trans/R2K, both saw strong net weekly gains, and it does bode well for the broader market next week. On balance, it would appear the market is more likely to first reach 1920/50 zone, rather than fall to the 1815/00 zone. 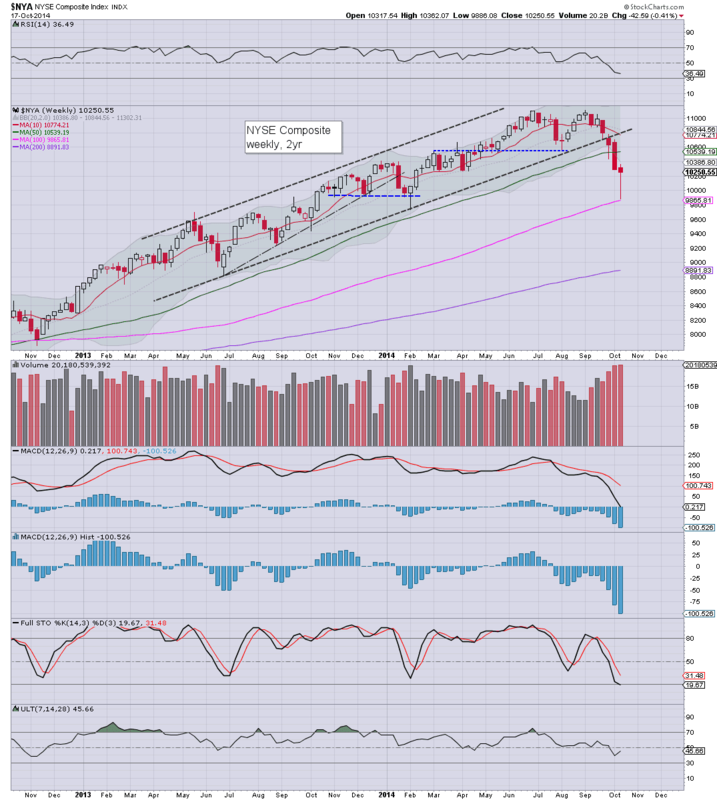 Even if there is a move lower next week to 1815/00, a subsequent bounce into the 1900s looks a given. What seems paramount to keep in mind, is the technical damage done to the weekly and monthly cycles. Even a move into the sp'1950/70 zone, will NOT reverse the damage to underlying price momentum. The sp'1650s seem a very viable downside target. For me, the only issue is whether that happens this side of Christmas... or in early 2015. Best guess... November. There is very little scheduled data due next week. Thur' - jobless claims, PMI manu', leading indicators. *there is QE, Mon' $1bn, Tue $1.5bn, Thur' $1.5bn. No doubt, that will help negate some of the selling out there. Despite a powerful rally from sp'1820 to a Friday high of 1898, it was unquestionably another week where the equity bears caused further damage to the broader trends. 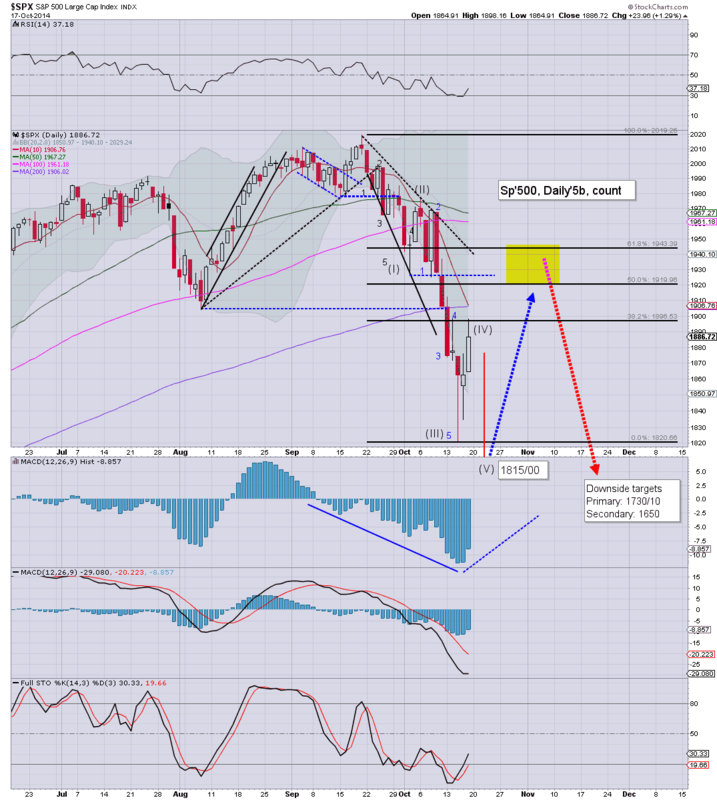 Regardless of any near term bounces, the market looks headed for the sp'1600s. Suffice to say, the new multi-week lows - below the big sp'1900 threshold, was a huge victory for the equity bears. The VIX fully confirmed the broader weakness, having exploded to 31.06, the highest level since late 2011. The third consecutive red candle on the weekly 'rainbow' chart, is something we've not seen since Nov' 2012. 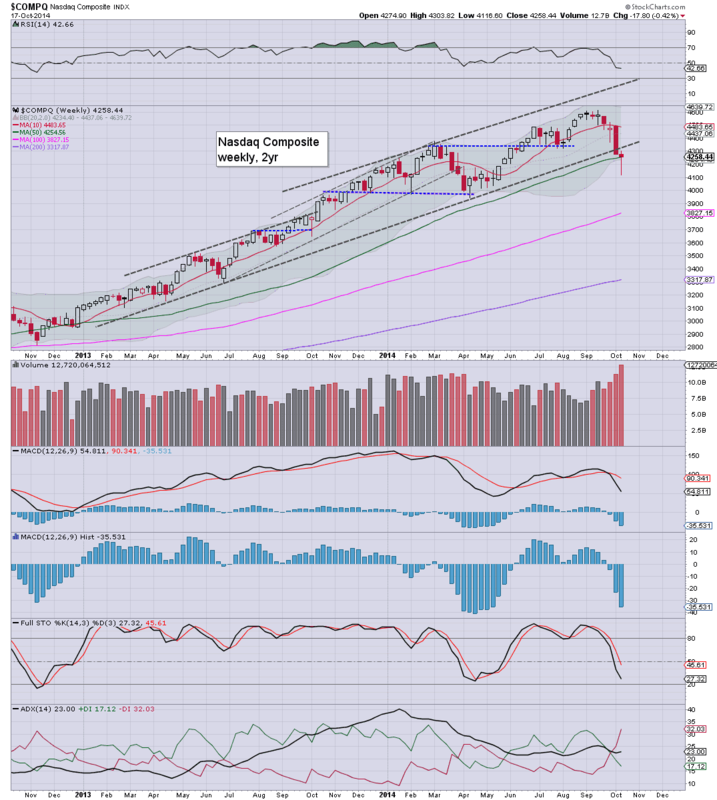 The bulls could justifiably argue we are bouncing off support on the giant monthly cycle, but other indexes - notable the R2K, and Dow, are already broken. Without question (at least to me), all bounces are to be treated as such, and I will be seeking to be broadly short the US indexes, and Long VIX, until the market hits sp'1650. Whether that occurs next month, or not until early 2015... I don't much care. US equities ended the week with some gains, sp +23pts @ 1886 , but somewhat below the intra high of 1898. The two leaders - Trans/R2K, settled +1.5% and -0.3% respectively. Near term outlook continues to offer another wave down to 1815/00 zone. *chart daily5b is a 'best guess', but any move much above 1900 next Monday, will negate the idea of a sub'5th. Suffice to say, the Dow has broken its six day downside run... but the damage has been done, especially on the bigger weekly/monthly cycles. Near term outlook is somewhat uncertain. There is threat of another minor wave lower to 1815/00 zone, but regardless, a move to 1920/50 zone looks likely by early November. From there, we look set for another major wave lower... to the 1700s, if not the 1650s.